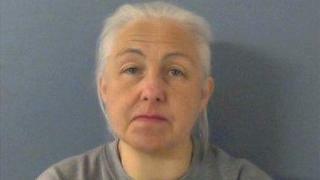 A woman who "systematically" abused her husband by hitting him with objects, weakening him until he died, has been found guilty of his murder. Hannegret Donnelly, 55, of Aylesbury, Buckinghamshire, controlled husband Christopher's life "through threats and beatings", police said. Mr Donnelly's blood spatters were found across furniture and the walls of the couple's home because of what police described as "repeated beating" and she admitted abusing her husband. Det Ch Insp Felicity Parker said Mr Donnelly's body was "severely weakened" by his wife's abuse and she did not seek medical assistance "when Christopher needed it the most". "Domestic abuse can affect anyone in our society irrespective of their gender," she said. "Christopher was repeatedly physically abused by his wife, she controlled his life through threats and beatings and he did not or could not seek help. "I would therefore urge anyone who is the victim of abuse to come forward and seek help, support and report it."